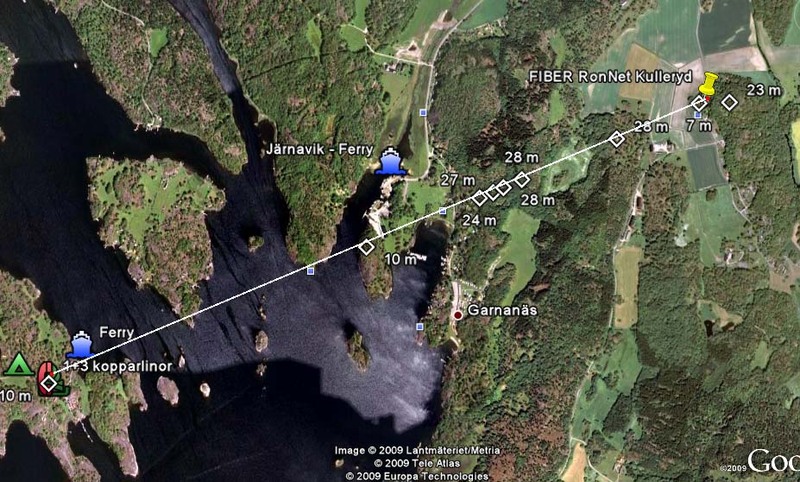 Update: I am now researching if we can build a link from Karlshamnsverket (google maps),Â 13 km away. The power plants chimneys are 140 meters high. I have been spending the last days researching how to build a high speed internet radio link to Tjärö. And I now have a plan! In Kulleryd, next to the old school, there is a gigabit fiber in the ground. The distance to Tjärö is 3.32 km. If we can get the radio antenna high enough in the air, Tjärö will be in line of sight. RonNet is the provider of the fiber, and I have had several talks to one of their technicians. The link we would use is a 5 GHz Mikrotik link. It’s full-duplex, and it might achieve up to 75 MBit/s real speed, and even half of that would be great. Price at 8995 SEK. To get the antenna at the school high up in the air we could either use a sky-lift or a telescopic lamp pole (used at construction sites). Both can be rented from for example Cramo. That’s it! In theory at least. I would roughly estimate the cost of this to 20 000 SEK. I’d love to get feedback from anyone with experience of similar links. And if you would like to study the locations in detail, I have made a Google Earth KMZ-file available. It also includes the position of all 3G antennas around. We used directional antennas to get some more gain to the signal. Since you are talking about a sky-lift i guess this is something temporary? The most important thing when using directional antennas is stability. The more sensitive the antenna is the narrower the “lobe” is. That is small movements in the fixture could be the difference inbetween link and no link. An alternative that could work is a sturdy tree, but then if your setup is to be used during a stormy season this might not be the best.